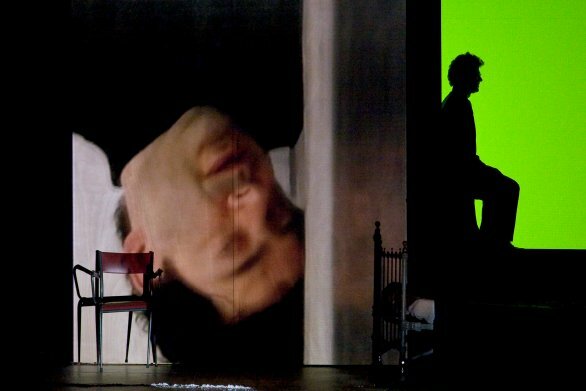 Writer Harwan is so preoccupied with his 15,000 page thesis on theater and director Robert Lepage that he barely notices the odd things that are happening in his dingy hotel room- an old phone rings without being plugged in, shadows move around on their own volition and there is even a little inside snowing. Meanwhile, Harwan is preoccupied with a recent breakup and trying to track down Lepage for a final interview and taking time out to argue on the phone with his father and sister. These are the peripheral plot points in Wajdi Mouawad’s 2008 tour de force “Seuls” currently in a limited run at the Wilma Theater in Philadelphia. Mouawad is a prolific Lebanese-Canadian playwright, actor and directs himself in this play, which he performs in French with English subtitles and short passages in Arabic that are not subtitled. Mouawad’s play “Scorched” (a hit at the Wilma in 2009) was a drama about refugees and political émigrés and Mouawad continue to explore these themes in Seuls. In this play the main character’s father moved his family from war torn Lebanon to Canada and Harwan grapples with what was left behind and what it might mean now in various aspects of his life in his adoptive country. He argues with his father over the phone when he has to cancel a visit and the conversation devolves into a bitter family fight. Meanwhile he finds out that his interview with Lepage has been canceled because the director is now rehearsing a new play in Russia, so he immediately books a flight. On his way, he receives a fateful phone call in the from his sister with the news that their father has had a stroke and is in a coma. Harwan goes to him and recalls places, events and images from his childhood and pivotal moments in their relationship that dredges up bitterness and love between father and son. Flash forward to Europe where Harwan has just found out that Lepage is back in Canada. Harwan takes the news well, but starts to unravel when he realizes that, on top of being stranded again, he has luggage filled with paint canisters. Meanwhile that corded phone is also in the room and it is ringing again, his sister Layla is leaving him a message about their dad on that phone that phone rings without being plugged in. And then the play’s mysteries are revealed in an instant. ‘Seuls’ is a one – man show that unfolds over two unpaused hours and will not be for everyone even though Mouawad is a consummate actor and he is fascinating in every moment. As impressive as that is, ‘Seuls’ doesn’t escape a level of theatrical tedium- There are obscure references to Lepage’s work and Harwan’s business wrangling with a publisher strikes as filler. And there is way too much business with phones, computers and mobiles that hit the same notes of verisimilitude. The startling denouement explains the rhetorical devises and everything suddenly makes theatrical sense. Fortunately the play’s artistic designs rescue some of any static theatrical rhythms, chief among them Dominique Daviet’s masterful film projections in tandem with lighting design by Éric Champoux and equally compelling soundscape and original music by Michel Maurer and Michael Jon Fink. The arresting designs framed in Emmanuel Clolus’ stark set prove to be a most poetic visual template for Mouawad’s transformational finale.